Wiley College in Marshall, Texas, is the first African-American college established in the Lone Star State. The institution was founded in 1873 by Bishop Isaac Wiley of Methodist Episcopal Church and chartered by the Freedman’s Aid Society in 1882. Isaac Wiley grew up with dreams of becoming a minister but instead turned to medicine. In 1850 he was given the opportunity to go to China on a medical missionary trip. Following his return to the United States he entered the ministry and rose through the ranks before becoming a Bishop in 1872. In 1873 he founded Wiley College. The college is now affiliated with the United Methodist Church and is dedicated to the idea of social responsibility and seeks to contribute and revitalize the community, which it serves. 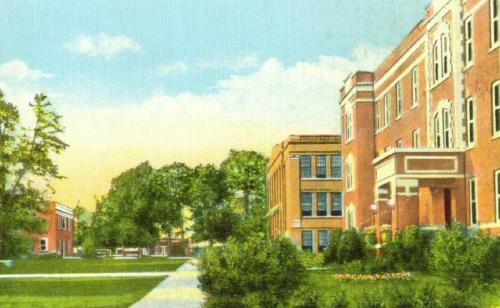 Wiley College was established to provide an education to newly freed men and women and to prepare them for a new life. It was also established to train teachers for careers at black elementary and secondary schools in Texas and other states and territories. One of the most notable alumni of Wiley College is James L. Farmer Jr., the son of a long-time Wiley professor. James L. Farmer, Jr. was a distinguished civil rights leader who was one of the founders of the Congress of Racial Equality (CORE) in 1942. He was the National director for CORE from 1961 to 1966 and served as the Assistant Secretary for the US Department of Health, Education, and Welfare in the Nixon Administration for one year. Heman Marion Sweatt, the plaintiff in the U.S. Supreme Court Case in 1950 which desegregated the University of Texas Law School, was also a graduate of the institution. Wiley now offers Associate and Bachelor’s Degrees in 17 areas including: English, biology, business, computer science, and social sciences, along with many more. The college is located on 63 acres of land west of Marshall, Texas between Dallas to the west and Shreveport, Louisiana to the east. The campus is comprised of seventeen buildings that are used for teaching, learning, and research, as well as residence halls for the students. The college also provides opportunities in higher education to non-traditional students through the Wiley Management Institute Program. Wiley College is an open-admissions college meaning that one just needs a high school diploma to gain admission. Wiley adopted the open admissions program in the 1970s to allow more students access to a college education. Quintard Taylor, In Search of the Racial Frontier: African Americans in the American West, 1528-1990 (New York: W.W. Norton & Company, Inc: 1998); Wiley College Website, http://www.wileyc.edu/ ; James Farmer Biography, http://www.umw.edu/cas/jfscholars/who/default.php ; Isaac Wiley Biography, http://www.famousamericans.net/isaacwilliamwiley/.